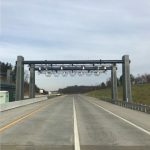 Scope of Project: The construction of the first cashless tolling system on the Pennsylvania Turnpike Commission roadway system. 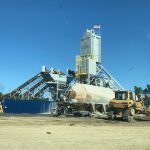 Project scope included the construction of a service building with architectural treatment, drilled caisson foundations, installation of precast concrete columns with architectural treatment and the installation of steel gantry structures. 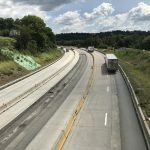 Work also included roadway reconstruction, drainage improvements, sign installation, precast white barrier and guide rail installation along with the application of pavement markings. 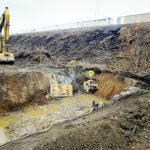 Scope of Project: For the reconstruction of SR30 which included construction of a 400 LF solider pile retaining wall with tiebacks, 35,000 CY of excavation, 30,000 CY of rock embankment, 15,000 of soil embankment, and reconstruction of the roadway. The schedule required working 7 days per week, 24 hours per day. Scope of Project: The complete reconstruction of the Bentleyville Interchange on SR70 which included construction of 2 bridge structures, extensions of 2 box culverts, and construction of a soundwall. 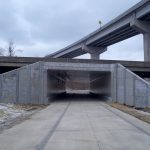 Scope of Project: As part of the reconstruction of the south junction a 1,140’ flyover bridge was constructed, 2 2-span bridges, a redesigned culvert for the 79 Southbound Ramp, and several small box culvert extensions were constructed. 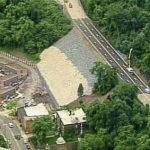 Scope of Project: The project included construction of a 600’ bridge over the Beaver, a 3 span railroad bridge, and a design build solider pile retaining wall.